The global dental endodontics market can be termed as a consolidated market with a healthy level of competition among the major players as two leading players holds more than 50% of the global market, states a new market research report by Transparency Market Research. On the other hand, the consumables segment is extremely fragmented in nature with a presence of a large number of regional and international players. Some of the leading players operating in the dental endodontics are Henry Schein, Inc., Coltene Holding AG, Septodont Holding, Peter Brasseler Holdings, FKG Dentaire S.A., Ivoclar Vivadent, Dentsply Sirona, Ultradent Products Inc, Mani, Inc, Danaher Corporation, and L.P. These players are focusing on technological advancements and innovations, which is estimated to encourage the overall growth of the global market throughout the forecast period. According to the market research report by Transparency Market Research, in 2016, the global market for dental endodontics was worth US$1.1 bn and is predicted to reach a value of US$1.7 bn by the end of 2025. The market is estimated to register a healthy 5.20% CAGR between 2017 and 2025. 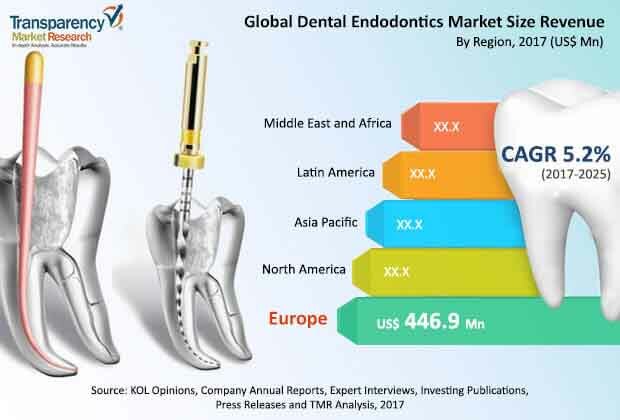 From a regional perspective, Europe is expected to lead the global dental endodontics market and account for a large share throughout the forecast period. This region is estimated to be followed by North America. On the other hand, Asia Pacific is estimated to offer potential growth opportunities for the market players in the next few years. The increasing awareness among consumers regarding the dental health and the improving healthcare infrastructure are the major factors that are predicted to accelerate the growth of the Asia Pacific market throughout the forecast period. Furthermore, the rapid development of the medical tourism industry and technological developments in this field are some of the other factors that are estimated to accelerate the growth of the dental endodontics market in Asia Pacific in the near future. Furthermore, on the basis of product type, the global market for dental endodontics market has been categorized into instruments and consumables. In 2016, the consumables segment accounted for more than 70% of the global market and is predicted to continue with its dominance throughout the forecast period. The high growth of this segment can be attributed to the increasing use of fresh consumables during the treatment procedures of endodontics. The global dental endodontics market is projected to grow at a healthy rate in the next few years. The rising geriatric population and the increasing prevalence of dental infections, owing to the changing eating habits are the key factors that are estimated to encourage the growth of the global dental endodontics market in the next few years. In addition to this, a significant rise in the incidence of accidents and a rise in the prevalence of dental ailments are further projected to accelerate the growth of the overall market throughout the forecast period. Furthermore, the rapid development of the dental tourism, especially in developing economies, such as India, Hungary, Mexico, and China is projected to accelerate the growth of the global endodontics market in the next few years. On the flip side, the high cost of the dental procedures and the strict regulations related to the manufacturing and approval of advanced innovative procedures are some of the key factors that are predicted to restrict the growth of the overall market in the near future. The rapid development of the medical tourism industry in developing economies to accelerate market growth. The competition among the key players expected to increase in the next few years with the expected entry of new players.